yes! mini quilts are so rewarding!! This looks like a wonderful book to add to anyones quilting library. Yummo! Perhaps I should look Iinto that book. Sounds like a fun book! Your mini turned out great! Pretty little quilt! And it took less than a day. I'm a sucker for a charm pack. Love your mini quilt!! The binding looks great to me!! Thanks for the chance to win - I would love to make some of the minis from this wonderful book. Your mini is very sweet, Nanette. You know I really enjoy making mini quilts so having this book would be a joy. Thank you for the chance. I can see myself making minis also. There are so many creative ideas from the Simply Charming Minis Book that I will be busy for quite a while. Then again there is Christmas and birthdays. Thank you for the chance to win a copy of such a treasured book. Thanks for the informative book review and sharing your mini project. It would be nice to win and try my hand at my first mini. Thanks for that chance. 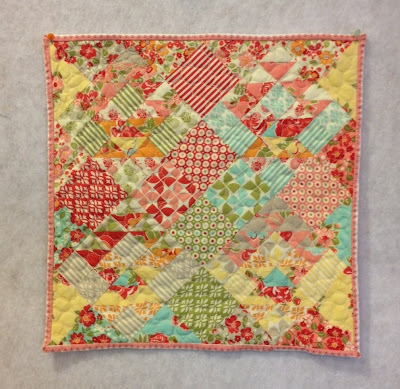 I love mini quilts - so sweet! The book looks awesome! Thanks for the chance! Oh I would Love to make one of those!!! Soooo cute!! Love what you made! I love Konda's patterns! I think I've avoided mini quilts long enough. I'm worried that I'll love them so much I won't want to make anything else! What fun fabrics in your mini! I would love a copy of the book. Konda has great ideas and minis are so fun! I'm thinking I should try making some minis. I would love to make mini's out of the book. They look so 'charming'. Cute mini! I would love to win this book! Thank you so much. Love, Love, Love, minis....as a busy working Grandma....I can handle this! The book looks wonderful! The book looks beautiful! Thanks for the chance to win it! Mini's are the way to go! I made one a couple of weekends ago. Two days start to finish for a completed mini quilt. Gotta love that! Thanks for the chance! Pretty excited about this book. It looks like it has some really great projects. Thanks for a chance at it! Oh what a gorgeous little quilt! I just love minis...they are just adorable. your mini quilt is wonderful. So colorful. And I like the scalloped edges you cut and put on the edge. HI! LOOKS LIKE A REALLY NEAT BOOK! It would be lovely to win the book and use a mini as the means to get back to quilting more than when a gift is needed. your mini is so pretty. love the binding idea to. thanks for a chance to win a book. I love making minis because of their instant gratification. Konda's book would be a welcome addition to my library and her minis to my ever-growing collection! Thanks for the chance, Nanette! Love your quilt! Hope I win a book, but one way or another I WILL have it! Cute mini! I enjoy your blog!! I have several of Konda's books and love them! I have seen those mini charm packs of 2.5 in. and wondered what would anyone want with those! You have given me a great idea to use them as mini quilts. This is going to be fun! Thank you. I'm in mini love!!! I can't wait to see the rest of the book tour and all of the sweet projects from this book! Thank you for sharing your cute little quilt! I think minis from charms is such a great idea. I love making minis! Your mini is adorable and thanks for the chance to win this book. Great mini! Must get hand on one of those books. I would love to win her book. This would be a fun project. Mini (quicker) projects... why don't I do them more often? Not every project needs to start off with (almost always impossible)grand illusions! I would love this book, it has such fun patterns. Your binding is so cute & clever, what a wonderful finishing touch to your project. I am SO hooked on minis! They make great little gifts for the girls (or boys) to use for their dolls and stuffed animals, or for small table toppers and, yes, for hanging on the wall (try framing one - so cool!) Thanks for the opportunity to win this lovely book. adorable mini! your fabric choice is excellent! super sweet quilt. Small projects are so great, and charm packs are perfect for them! Thanks for the chance to win this book!! These mini quilts look soo fun to do ! Thanks for the giveaway! What a lovely little quilt! Thanks for the chance to win! Such a cute little quilt - would look great framed! OH your little quilt is so pretty. Perfect choice of fabrics. I'd love to have this book. Thank you so much for showing us your quilt and the chance. Pretty little quilt. I'd love to win a copy of that book. I really enjoy making mini quilts. I would love to own this book. Your mini turned out so cute and cheerful. The quilts look like a lot of fun to make and I think I would finish them! This looks like a wonderful book. Thanks for the opportunity to win. Your mini quilt looks great!! Thanks for a chance to win a copy of this book. Mini quilts are so much fun to do. I really like how you added the scallop. I was just about to leave you a comment anyway to tell you how sweet that quilt was ... I think I might even be able to manage a mini! I love small quilts. I've been a fan of yours for several years and also a fan of Konda's. I love that fabric! I have several of Konda's books and really find them so easy to follow. I'd love the opportunity to win the Mini book. Finishing a project in one day is so appealing! Love mini's and yours is certainly adorable!! Would love to win a copy of this book!! Thanks for the chance! Your mini quilt is really pretty. I haven't made a mini, but this book could inspire me. Oh I love your quilt! The colors in your mini are beautiful! Fantastic job! What a wonderful mini! I am in love with the projects in this book! I love your binding too~ too sweet! Thanks for the chance! Looks like a great book...thanks for the chance! Marmalade charms look good in a mini quilt. Thanks for the offering Konda's book. that is a cute mini quilt. Thank you for a chance to win. Very pretty mini and love how you did the binding. I would love a chance to win this fantastic book! Oh, I would love to win a copy. I love the style and cuteness of mini -quilts. Thanks for the chance to win. Therese. thanks for the opportunity to win this book. I look forward to making minis from the book! Love all the colors in this mini quilt! I haven't made any minis yet, but I would love to try! Minis would be a great alternate for bigger quilts, to keep it fresh and fun. Thanks for a chance to win! This just makes me happy! All of your things have a prettiness about them which I love! I would love to make a mini quilt from this book!! Beautiful mini! What a fun book! I see your baskets -- so sweet! What fun projects these must be. I just love your little mini! You're right though, I would have missed the baskets altogether if you had not pointed them out. No matter - it is really cute anyway :*) Would love to win a copy of the book!!! I'm loving the looks of these little quilts. Would love to be making them. So cute. Love mini quilts and your ideas! Thank you! I love anything "mini"! Konda's book looks like something I really NEED and WANT in my quilting library. Love your mini, they are so much fun to make! I have been following this book and reading the reviews it looks fantastic. Thank you for the chance. 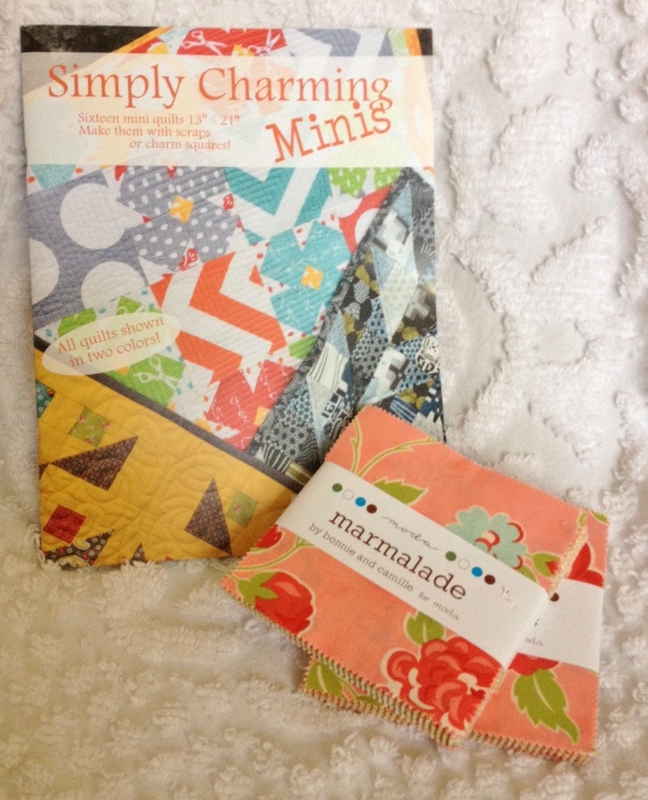 Love all Konda's books and would luv to add the Simply Charming Minis to my quilting library. Thanks for the chance!! Love Konda's books. Thanks for the chance to win her newest. Your mini quilt looks terrific. Thanks for sharing and thanks for the giveaway. I would LOVE to win this book! It looks like so much fun!! That turned out really nice. I love anything done in minature. This book looks like fun. Thanks for the chance to win! Me too! I would love to win this "charming" little book! I love the color orange and this mini is too cute!!! I would love to win this book! Thank you so much for the inspiration! Your mini is a delight! It looks exactly like summer. I like mini's. They go together so quickly, and if you don't like the way one turns out, you just give it away, and start again! Sounds like a fabulous book...I'd love to win a copy. Thanks for the opportunity. I would love to win this book. Thank you for the opportunity to win. Wow! I would Love to make one of those!!! So preatty! Some instant "quilty" gratification would be appreciated; thanks for the giveaway. The scallop edge for the binding is making me squeal Nanette! That is such a good effect! What a cute little mini quilt. I love the binding/border. It looks great. Looks like fun! I want to play too!! Hope I win. Love the mini's! Count me in! Cute mini quilt. Would love to make some! Love your treatment of this pattern, your binding made me exclaim out loud! I love making minis and would love to see what to see what this book has to offer. Thank you for the chance to win. You did a great job, love your mini. They can be addicting and so much fun. thanks for the chance to win. I love mini quilts and yours is adorable! I'd love to win this book. thanks for the giveaway! Love your mini. Thanks for chance to win the book. Very nice mini. Thanks for the chance to win the book. I just realized that I can make baby quilts rather than larger quilts I cant quilt myself-lol and now this, I am really interested in this now! So adorable! I can't imagine cutting those tiny triangles for the basket blocks. This book seems so great. Thanks for the chance! I've been on a sewing blitz making small quilts lately - would love to try some in this new book! Sounds super-fun! Would love a chance to try my hand at some minis! Your mini quilt is so cute. The scalloped edge looks great. Hi, Nan that mini quilt book looks fun and of course your quilt is darling. Can't wait to see you in a couple weeks. It will be here before you know it. Who doesn't like instant gratification! I am looking forward to having this book and making some quick work of these adorable minis! What a fun book! I would love to make a few mini's. I love to get a project done quick. I love the charm pack your chose for your little mini quilt. I do love makin' a mini. So instantly satifying. I love mini quilts and your little basket quilt is adorable. Would love to win the book! Thanks for the chance! I have never made a mini! looks like fun! Mini quilts are great. I need this book. I would love to have this book and try a mini! Yours is precious! Thanks! I love the cheerful fabric choices you made for your mini! Mini's are a great way to try out patterns and/or fabrics fast, fast, fast! Love making quick and easy minis. Such a feeling of accomplishment. Really enjoy my Big Block Quilts by Konda Luckau. Would love to add Simply Charming Minis to my library. I love getting something done fast with a mini. The quilt designs are so pretty! What a wonderful book for miniquilts! I have lots of charm packs to choose from, so I'd love to win. I am so behind on blogging...you have had a lot going on!!! Love your mini Marmalade quilt! I really like the mini quilts. Something I can get done in a weekend. Cute mini quilt. I am starting to make minis again in between QOV's. They are the perfect size for my color and design class i'm taking. I love to win a copy--love minis! I can see the baskets if I squint, the fabric is very colorful. And pretty! Thanks.